How much do you love your partner? How much do you trust them? And can they trust you? 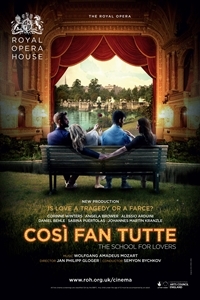 Mozart's classic opera Così fan tutte puts two pairs of lovers to the test - with great music but distinctly unexpected results. For this new production, director Jan Philipp Gloger creates a richly theatrical world as the playground for this quirky comedy, where two men try to woo each other's partners for a bet. Don Alfonso - the puppet master of this experiment in love - is here a theatre director who uses all the sets, props and tricks of his trade to invent new scenes to challenge the lovers' affections. This lively, youthful and imaginative take on one of the world's best-loved operas is performed by a cast of rising stars conducted by Semyon Bychkov.